Obstruction to outflow of aqueous humor through the trabecular meshwork into Schlemm’s canal leads to increased IOP. It usually is bilateral. Increased IOP eventually destroys optic nerve function causing blindness. Results in increased IOP because of obstructed outflow of aqueous humor. However, acute closed-angle glaucoma typically involves sudden, complete, unilateral closure with pupil dilation stimulated by a dark environment, emotional stress, or mydriatic drugs. Slit-lamp examination reveals abnormalities in the anterior vitreous humor. Objective of treatment is to prevent optic nerve damage by lowering the IOP to a level consistent with retaining vision. Treatment is almost always lifelong. Treatment also focuses on achieving the greatest benefit at the least risk, cost and inconvenience to the patient. Beta-adrenergic blockers/antagonists are the most widely used hypotensive agents. They are effective in many types of glaucoma. Cholinergic agents (topical) are miotics (cause papillary constriction) and are used in short-term management of glaucoma with papillary block. Alpha-2-adrenergic agonists(topical) reduce IOP by increasing aqueous humor outflow. Carbonic anhydrase inhibitors (systemic) and prostaglandins lower IOP by reducing aqueous humor formation. Osmotic diuretics reduce IOP by increasing the osmolality of the plasma to draw water from the eye into the vascular circulation. Ophthalmic laser surgery is indicated as the primary treatment for glaucoma or is required when medication therapy is poorly tolerated or ineffective in lowering IOP. Filtering procedures: an opening or a fistula in the trabecular meshwork (trabeculectomy) is made to allow drainage implant or shunt surgery may be performed. Discuss preoperative and postoperative teaching for immediate surgical opening of the eye chamber. Prepare to administer carbonic anhydrase inhibitors IV or IM, to restrict production of aqueous humor. Prepare to administer osmotic agents. Discuss and prepare the client for surgical or laser peripheral iridectomy after the acute episode is relieved. Provide information about laser trabeculoplasty, if medication therapy proves ineffective. Teach the client about specific safety precautions. Instruct the client to avoid mydriatics such as atropine, which may precipitate acute glaucoma in a client with closed-angle glaucoma. Instruct the client to carry prescribed medications at all times. Instruct the client to carry a medical identification card or wear a bracelet stating his type of glaucoma and need for medication. Instruct the client to take extra precautions at night (e.g. use of handrails, provide extra lighting to compensate for impaired pupil dilation from miotic use). Which of these is not a feature of ocular hypertension? Which of these is not a likely cause of painful red eye in a patient? Which of the following are not suitable adjuncts? Which class of drug is the first line of therapy for open angle glaucoma when no contraindication exists? Which one of the following agents lowers intraocular pressure by reducing aqueous production? Which one of the following statements regarding pilocarpine is true? A 75 year old lady with a long standing history of asthma treated with steroids presents to the clinic because of decreased vision. She is found to have posterior capsular opacities as well as an intraocular pressure of 28 mmHg. Which of the following medication should be prescribed? Determine type and degree of visual loss. Rationale: Affects choice of interventions and patient’s future expectations. Allow expression of feelings about loss and possibility of loss of vision. Rationale: Although early intervention can prevent blindness, patient faces the possibility or may have already experienced partial or complete loss of vision. Although vision loss cannot be restored (even with treatment), further loss can be prevented. Implement measures to assist patient to manage visual limitations such as reducing clutter, arranging furniture out of travel path; turning head to view subjects; correcting for dim light and problems of night vision. Rationale: Reduces safety hazards related to changes in visual fields or loss of vision and papillary accommodation to environmental light. Demonstrate administration of eye drops (counting drops, adhering to schedule, not missing doses). Rationale: Controls IOP, preventing further loss of vision. Rationale: These direct-acting topical myotic drugs cause pupillary constriction, facilitating the outflow of aqueous humor and lowering IOP. Note: Ocusert is a disc (similar to a contact) that is placed in the lower eyelid, where it can remain for up to 1 wk before being replaced. Stress the importance of meticulous compliance with prescribed drug therapy. Rationale: To prevent an increase in IOP, resulting in disk changes and loss of vision. Rationale: [Beta]-blockers decrease formation of aqueous humor without changing pupil size, vision, or accommodation. Note: These drugs may be contraindicated or require close monitoring for systemic effects in the presence of bradycardia or asthma. Rationale: Carbonic anhydrase inhibitors decrease the rate of production of aqueous humor. Note: Systemic adverse effects are common, including mood disturbances, GI upset, and fatigue. Acetazolamide (Diamox), methazolamide (Neptazane), dorzolamide (Trusopt). Rationale: Contracts the sphincter muscles of the iris, deepens anterior chamber, and dilates vessels of outflow tract during acute attack or before surgery. Rationale:Decreases secretion of aqueous humor and lowers IOP. Rationale: Adrenergic drops also decrease formation of aqueous humor and may be beneficial when patient is unresponsive to other medications. Although free of side effects such as miosis, blurred vision, and night blindness, they have potential for additive adverse cardiovascular effects in combination with other cardiovascular agents. Note: Light-colored eyes are more responsive to these drugs than dark-colored eyes, necessitating added considerations when determining appropriate dosage. Provide sedation, analgesics as necessary. 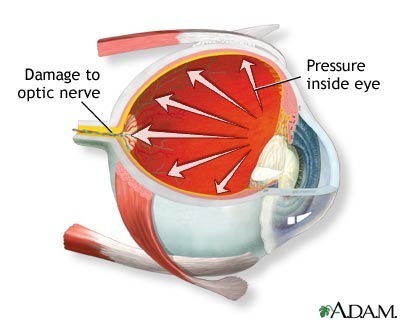 Rationale: Acute glaucoma attack is associated with sudden pain, which can precipitate anxiety and agitation, further elevating IOP. Medical management may require 4–6 hr before IOP decreases and pain subsides. Rationale: Filtering operations (laser surgery) are highly successful procedures for reducing IOP by creating an opening between the anterior chamber and the subjunctival spaces so that aqueous humor can bypass the trabecular mesh block. Note: Apraclonidine (Lopidine) eye drops may be used in conjunction with laser therapy to lessen or prevent postprocedure elevations of IOP. Rationale: Surgical removal of a portion of the iris facilitates drainage of aqueous humor through a newly created opening in the iris connecting to normal outflow channels. Note: Bilateral iridectomy is performed because glaucoma usually develops in the other eye. Postoperative care after peripheral iridectomy includes cycloplegic eyedrops. Rationale: To relax the ciliary muscle and to decrease inflammation, thus preventing adhesions. Cycloplegics must be used only in the affected eye. the use of these drops in the normal eye may precipitate an attack of acute angle-closure glaucoma in this eye, threatening the patient’s residual vision. Rationale: Separates ciliary body from the sclera to facilitate outflow of aqueous humor. Rationale: Used in intractable glaucoma. Rationale: Experimental ocular implant device corrects and prevents scarring over or closure of drainage sac created by trabeculectomy. Evaluate anxiety level, degree of pain experienced or suddenness of onset of symptoms, and current knowledge of condition. Rationale: These factors affect patient perception of threat to self, potentiate the cycle of anxiety, and may interfere with medical attempts to control IOP. Give accurate, honest information. Discuss probability that careful monitoring and treatment can prevent additional visual loss. Rationale: Lessens anxiety related to unknown or future expectations, and provides factual basis for making informed choices about treatment. Allow patient to acknowledge concerns and express feelings. Rationale: Provides reassurance that patient is not alone in dealing with problem. 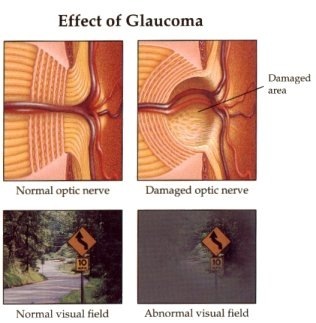 Stress the importance of glaucoma screening. Rationale: For early detection and prevention. All people older than age 35, especially those with family histories of glaucoma, should have an annual tonometric examination. Review pathology and prognosis of condition and lifelong need for treatment. Rationale: Provides opportunity to clarify and dispel misconceptions and present condition and something that is manageable. Discuss necessity of wearing identification (MedicAlert bracelet). Rationale: Vital to provide information for caregivers in case of emergency to reduce risk of receiving contraindicated drugs (atropine). Demonstrate proper technique for administration of eye drops, gels, or discs. Have patient perform return demonstration. Rationale: Enhances effectiveness of treatment. Provides opportunity for patient to show competence and ask questions. Review importance of maintaining drug schedule like eye drops. Discuss medications that should be avoided such as mydriatric drops (atropine, propantheline bromide), overuse of topical steroids, and additive effects of [beta]-blocking when systemic [beta]-blocking agents are used. Rationale: This disease can be controlled, not cured, and maintaining a consistent medication regimen is vital to control. Some drugs cause pupil dilation, increasing IOP and potentiating additional loss of vision. Note: All [beta]-blocking glaucoma medications are contraindicated in patient with greater than first-degree heart block, cardiogenic shock, or overt heart failure. Identify potential side effects and adverse reactions of treatment such as decreased appetite, nausea and vomiting, diarrhea, fatigue, “drugged” feeling, decreased libido, impotence, cardiac irregularities, syncope,heart failure (HF). Rationale: Drug side and adverse effects range from uncomfortable to severe or health-threatening. Approximately 50% of patients develop sensitivity or allergy to parasympathomi-metics (pilocarpine) or anticholinesterase drugs. These problems require medical evaluation and possible change in therapeutic regimen. Encourage patient to make necessary changes in lifestyle. Rationale: A tranquil lifestyle decreases the emotional response to stress, preventing ocular changes that push the iris forward, which may precipitate an acute attack. Reinforce avoidance of activities such as heavy lifting and pushing, snow shoveling, wearing tight or constricting clothing. Rationale: May increase IOP, precipitating acute attack. Note: If patient is not experiencing pain, cooperation with drug regimen and acceptance of lifestyle changes are often difficult to sustain. Discuss dietary considerations (adequate fluid, bulk or fiber intake). Rationale: Measures to maintain consistency of stool to avoid constipation and straining during defecation. Stress importance of routine checkups. Rationale: Important to monitor progression and maintenance of disease to allow for early intervention and prevent further loss of vision. Advise patient to immediately report severe eye pain, inflammation, increased photophobia, increased lacrimation, changes in visual field, veil-like curtain, blurred vision, flashes of light and particles floating in visual field. Rationale: Prompt action may be necessary to prevent further vision loss and other complications (detached retina). Rationale: Hereditary tendency to shallow anterior chambers places family members at increased risk for developing the condition. Note: African-Americans in every age category should have frequent examinations because of increased incidence and more aggressive course of glaucoma in these individuals. Identify strategies and resources for socialization like support groups, Visually Impaired Society, local library, and transportation services. Rationale: Decreased visual acuity may limit patient’s ability to drive and cause patient to withdraw from usual activities.